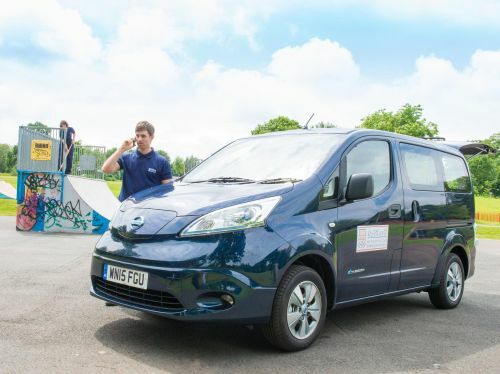 The multi award-winning all-electric Nissan e-NV200 is helping to make the West Midlands a better place to live after joining the fleet of Solihull Metropolitan Borough Council. The ground-breaking van, which costs just two pence per mile to run and offers zero emissions mobility, is being used by the local authority’s Neighbourhood Services team on a wide range of community focused projects. It’s one of the first 100% electric vehicles on the council’s 69-strong fleet, which includes everything from small city cars to minibuses and an 18-tonne tanker. Solihull’s Neighbourhood Services team co-ordinates and delivers projects that enhance and enrich communities right across the borough – everything from park improvements to sporting initiatives for teenagers. Team members used to operate a standard diesel Vauxhall panel van, but needed a second row of seats to accommodate apprentices and volunteers as well as a large, but not excessive, load area. The five-seat e-NV200 Combi was the perfect fit. Councillor Tony Dicicco, Cabinet Member for Environment, Housing and Regeneration said: “The e-NV200 has shown us just how electric vehicles can work for us. He added: “In addition to our clean-air responsibilities, it’s important that we as a council also do what we can to reduce the number of large vehicles on our roads. Launched last year, the Nissan e-NV200 combines the NV200 – a former International Van of the Year – with the proven technology of the record breaking Nissan LEAF – the world’s bestselling electric car. Available in panel van or five or seven-seat Combi form, it costs just two pence per mile to run and users also benefit from low maintenance costs that make for unrivalled total cost of ownership – £1,200 lower than a conventional diesel van over four years. It can cover 106 miles on a single charge* and can be charged from zero to 100% in just 30 minutes. Meanwhile, the model, which is priced from £13,568 in panel van form (incorporating Government Plug-In Van Grant) offers a class-leading 4.2m3 capacity and an impressive 703kg payload.